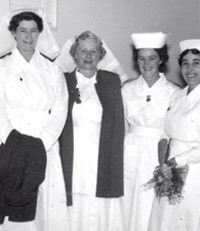 Nursing uniforms have changed in many different ways over the years - long gone are the hat and cape and the starched collars and in their place casual surgical scrubs, sometimes in an array of colours and patterns. This section traces some of the changes in uniforms over the years through photographs, stories and research. Pages in category "Nursing Uniform"